Fig. 1. There's a new bad guy in town, Volutaria, a new invasive knapweed, which appears to be yet another potentially-highly-invasive species similar to Brassica tournefortii, Saharan mustard. 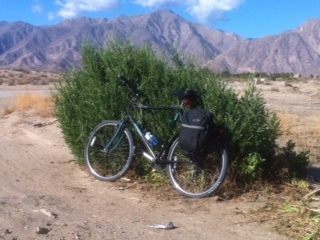 The bicycle is leaning against three mature plants of it in Borrego Springs. 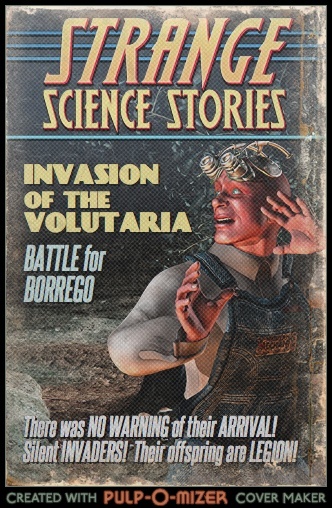 See also the Invasion of the Volutaria pulp magazine cover created by James Dillane. 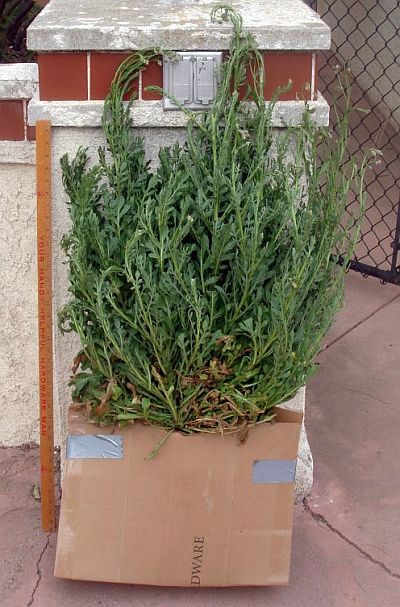 For now, we have decided just to call this new invasive knapweed Volutaria, both for the scientific name and the common name, because the actual name for the plants invading southern California is not abundantly clear. 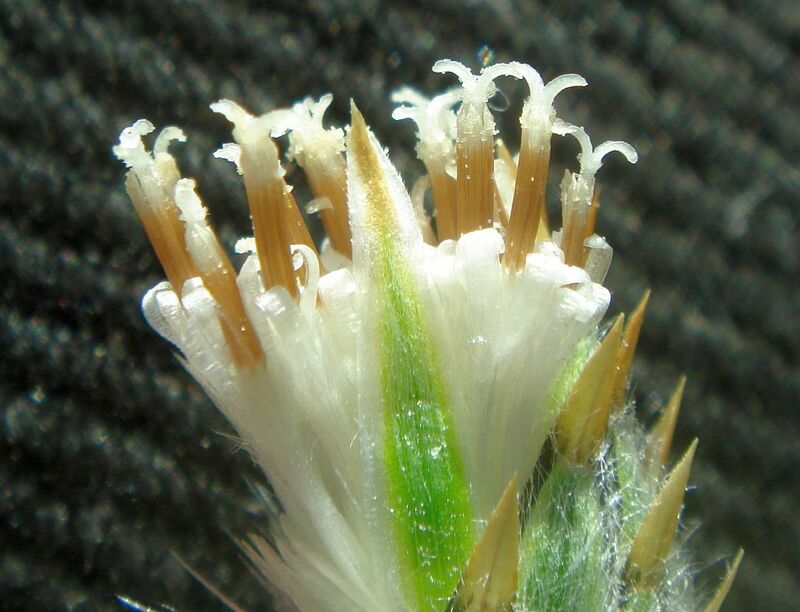 This species was first identified as Volutaria canariensis, Canary Island knapweed. Fortunately, Chris McDonald sent our pictures to colleagues in Spain, who thought it looked more like Volutaria tubuliflora; see Photographs of V. canariensis and V. tubiliflora from northern Africa. However, the flowers of our plants are not close matches to the flowers of either V. tubiliflora or V. canariensis. 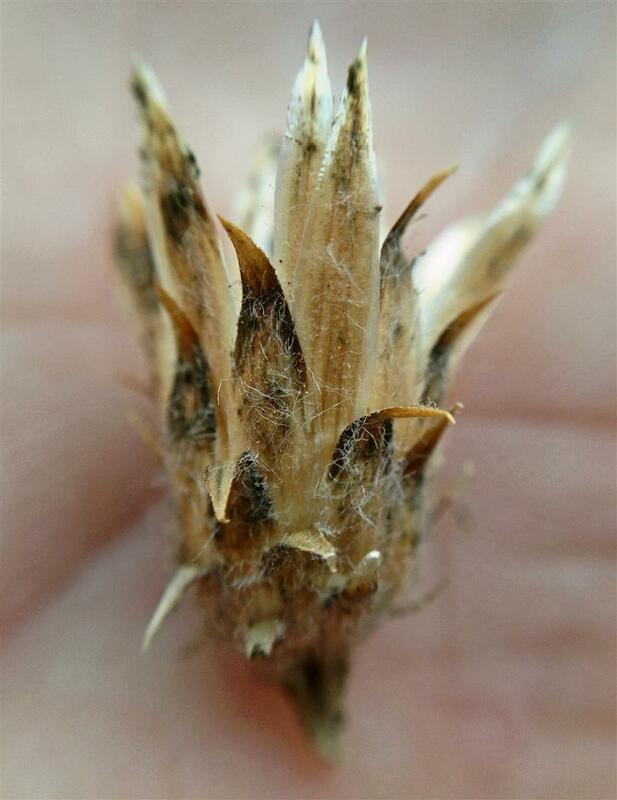 Work is ongoing to try to pin down whether our plants are indeed one of those two species, whether they are some other Volutaria species, or if they are a hybrid between several species. For now, we've decided it is easiest and clearest simply to call these plants Volutaria. Pictures linked on this page, and the url for this page, still have the previous name of canariensis, simply because we see little point in changing the name until we actually know what the name is. 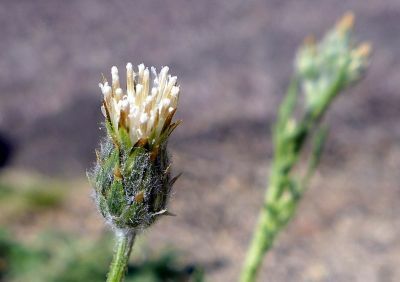 A species of Volutaria, Mediterranean desert knapweed, was first observed in the Borrego Springs area in 2010 as a single plant, although the population was undoubtedly larger. 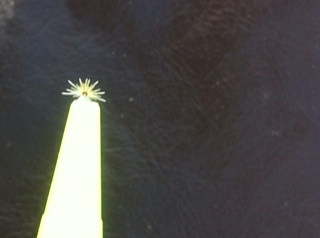 This was the only known location of this species in the United States. Its population in 2013-2014 had grown to at least 800 plants, with potentially many more seeds of it lying dormant in areas that did not receive monsoonal water flow. In 2015 its population has grown to at least 10,000 plants, despite heroic efforts being made by a number of people to remove it, and the seed bank at the end of spring 2015 may contain as many as one million seeds waiting to sprout in future years. Clearly, more resources are desperately quickly needed to have any chance of extirpating this invader. Very soon it will be nearly impossible to eradicate it. This species is potentially highly-invasive similar to Brassica tournefortii, Saharan mustard. 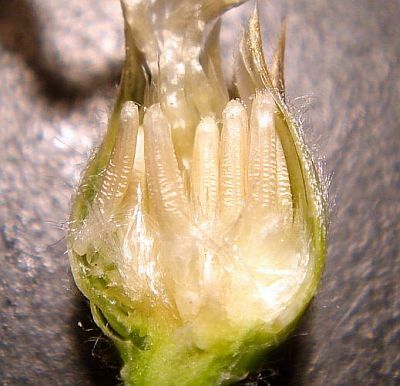 Each plant produces roughly 2500 seeds, allowing it to expand its population at a very high rate. In 2014, we wrote that it is extremely important to try to eradicate this species from the Borrego Springs area before it spreads to a larger area. 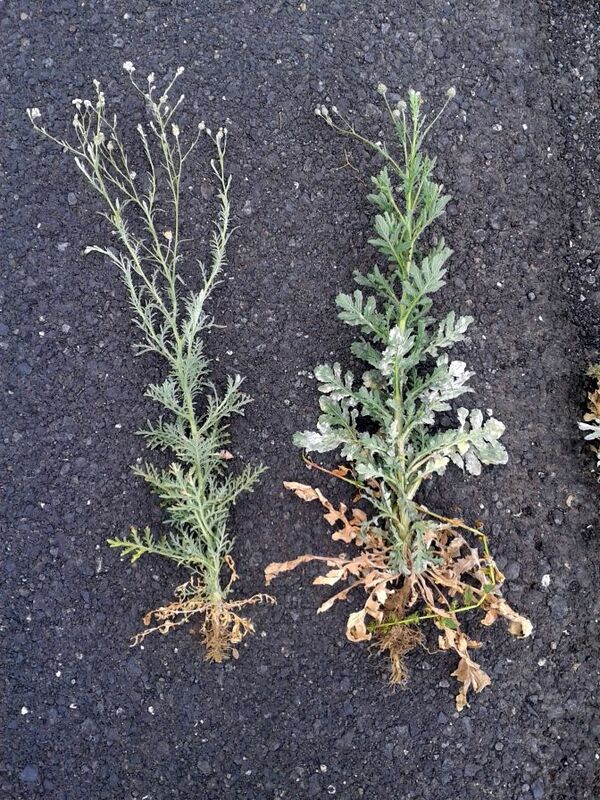 Unfortunately, on 31 March 2015 a population of ~500 to 1,000 plants was discovered in Upper Newport Bay, Orange County, which had obviously been present for at least one year, and maybe more. See Map of the population in Upper Newport Bay. There's a new bad guy in Borrego Springs, Volutaria, a new invasive knapweed, that has never been observed any place in the entire United States before. 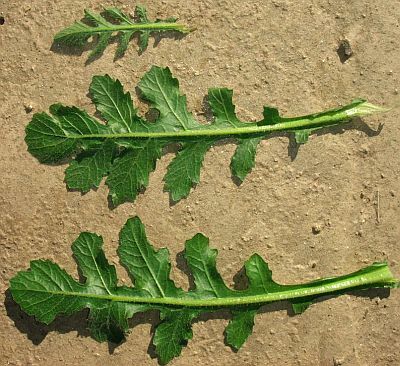 We all know what happened when the last bad guy came to town and stayed, Brassica tournefortii, Saharan mustard. We don't want this to happen again! 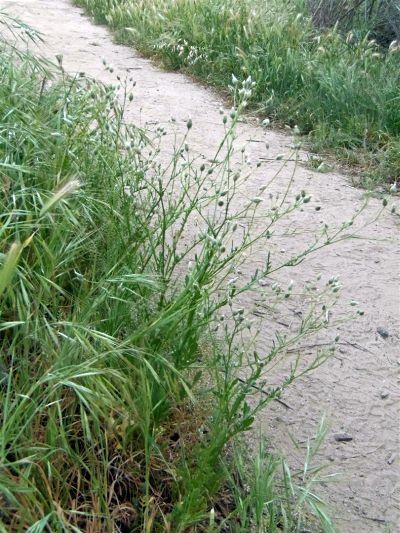 It is much easier to stop a new invasive species at the beginning, when it is found only in a small area, than to try to deal with it after it has become widespread. This species was first discovered in 2010, with a small number of plants observed in 2011, 2012 and 2013. 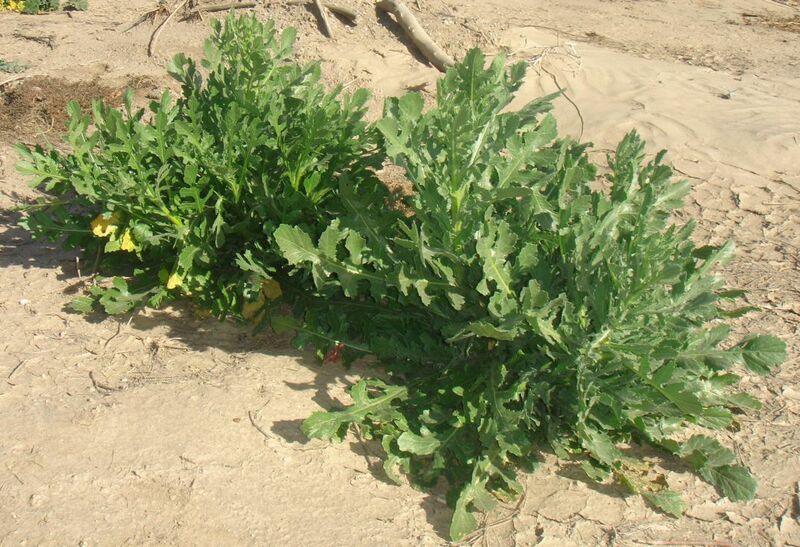 After the monsoonal flooding in summer 2013, almost one thousand plants germinated in the mud left behind by the water. 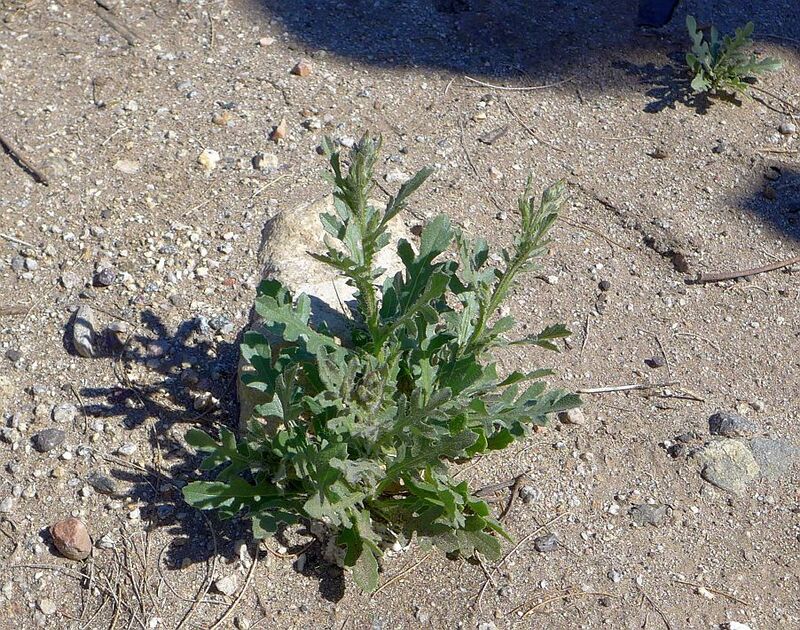 After Borrego Springs finally got some decent winter rain in late 2014, almost ten thousand plants germinated, a factor of ten more plants than were seen one year earlier. 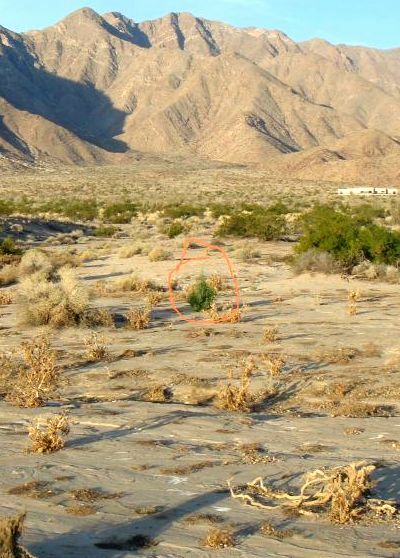 The observation on 23 February 2010 was on the Alcoholic Pass Trail on a hillside, and probably germinated from the one inch of rainfall received by Borrego Springs on 7 December 2009, or the five inches of rainfall received during 18-22 January 2010. Similar good fall / winter rainfall germinated the plants seen in 2011, and many of those plants probably went to seed unnoticed. 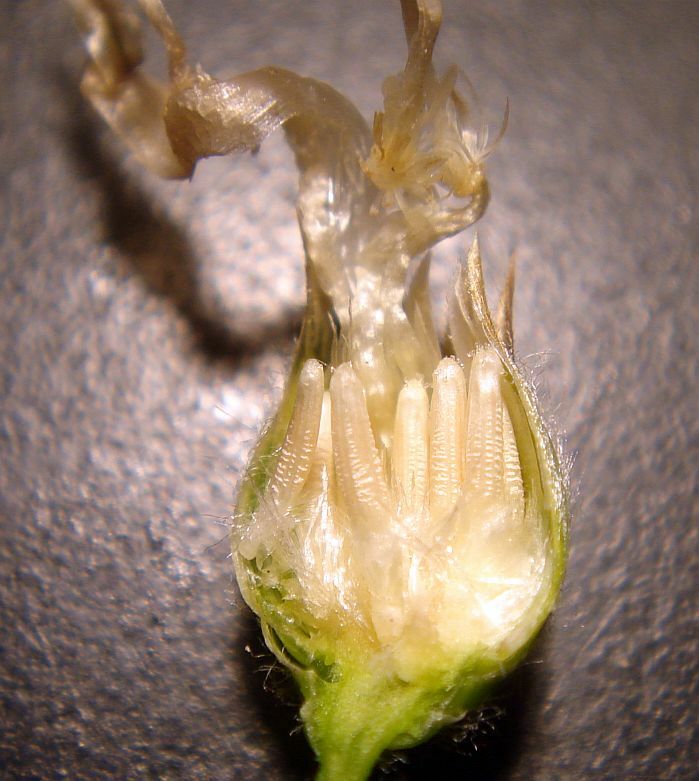 Since each plant can produce roughly 2500 seeds, we suspected in spring 2014 that there may be a large seed bank in Borrego Springs already, awaiting enough rain to germinate. This fear unfortunately turned out to be correct in 2015. 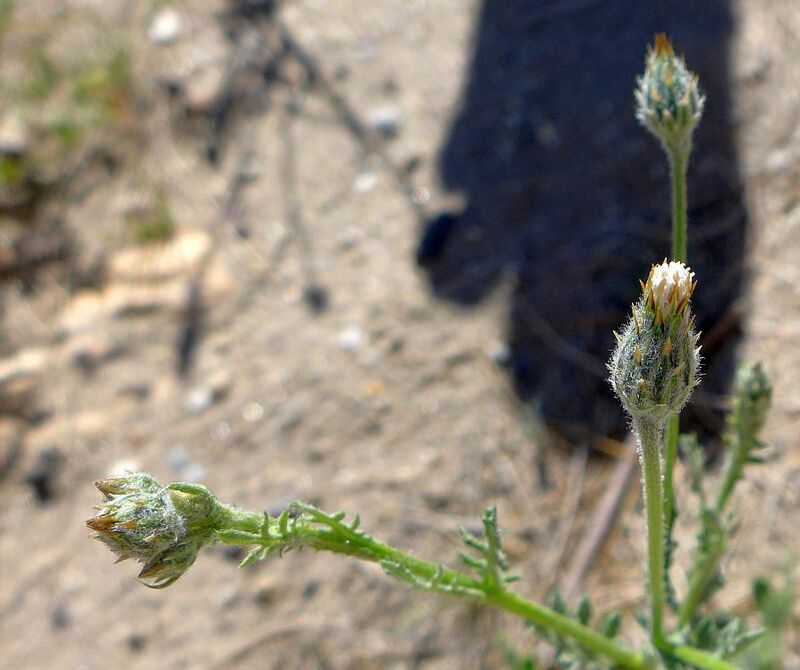 Until the 2014-2015 rainfall season, since the 2010-2011 rainfall season, Borrego Springs received essentially no fall / winter rainfall, making the monsoonal flooding the only chance for the seeds of this species to sprout in 2013-2014. Frank has long been involved in efforts to control non-native invasive weeds in the northwest and northern California. When he came to Borrego Springs for the winter in 2013-2014, he joined the effort to control Brassica tournefortii, Saharan mustard. 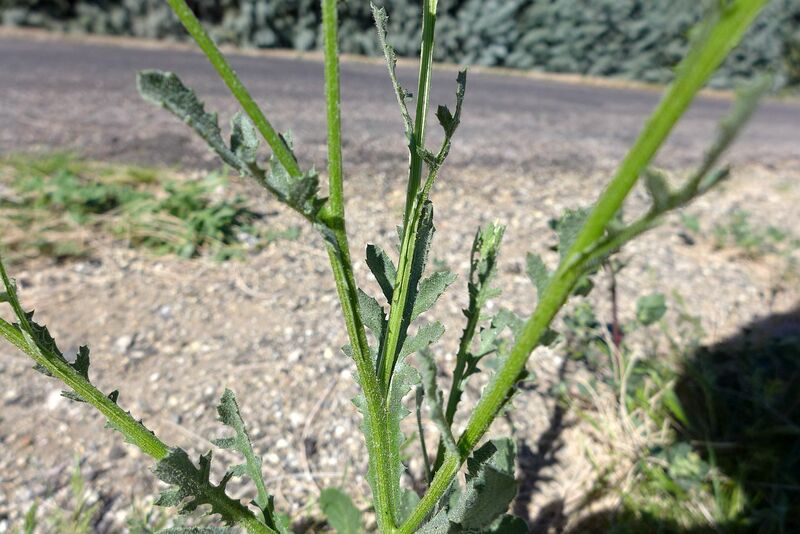 While removing the mustard in one area on 27 December 2013, he noticed the young rosette of a plant he didn't recognize and sent a picture to Tom, who immediately suspected it was Volutaria. On 4 January 2014, Kate Harper and Larry Hendrickson visited Frank's plant, and Larry confirmed it was Volutaria. 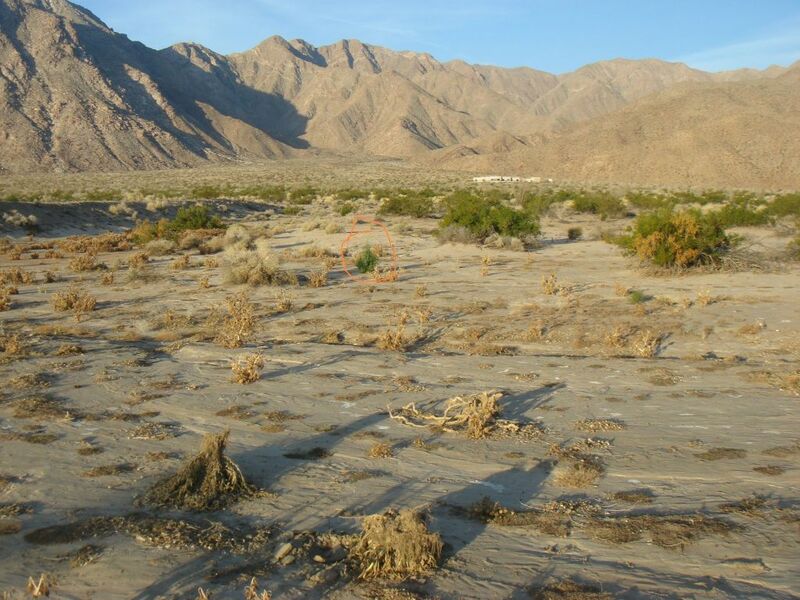 Thus began an intensive effort by Frank to survey the Borrego Springs Area for more plants, and to eliminate them as much as possible. As of 19 February 2014, over 800 plants have been found and removed. 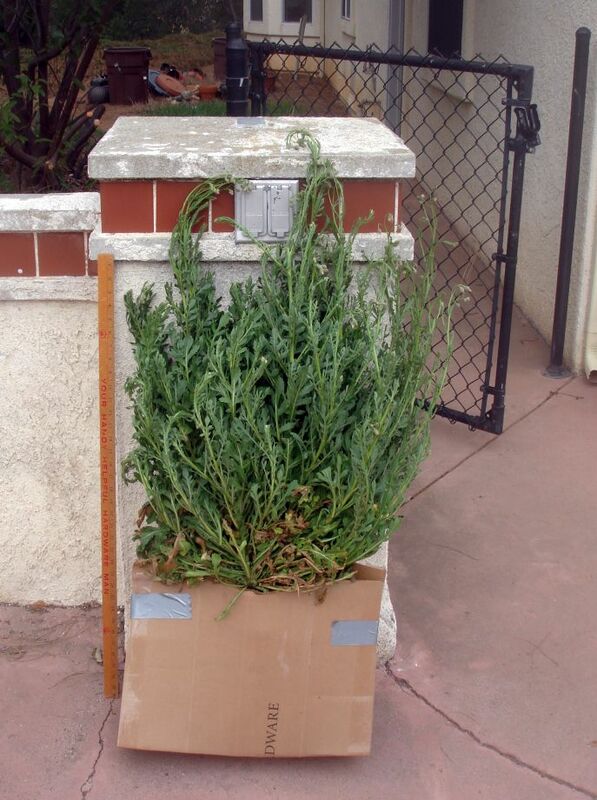 A small number of plants have been observed on private property, and Frank is still waiting for permission to access those properties to remove those plants. There well may be many more seeds present in other areas of Borrego Springs waiting for the next decent rainfall to germinate. 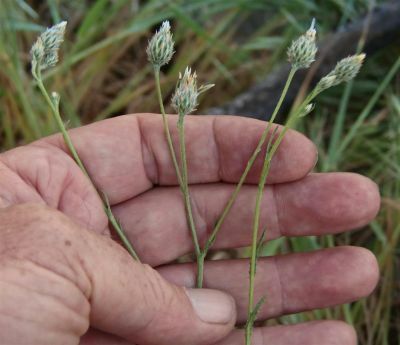 As of 5 March 2015, over 7500 plants have been found and removed, a factor of ten more than were found and removed in 2014. 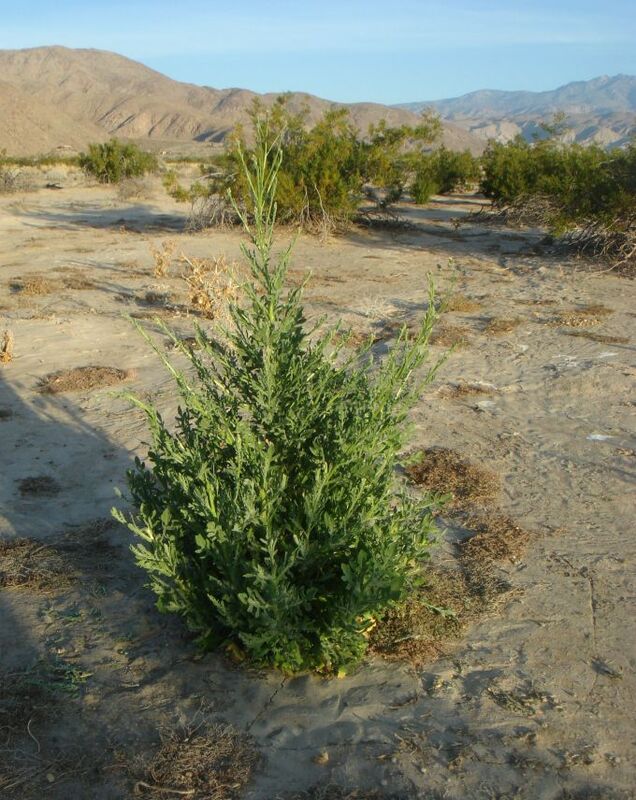 More plants continue to be found, with over 2000 plants removed from the area just outside two previously-known locations on 20 April 2015, and a new population of 200 plants discovered near the east end of Palm Canyon Drive near the Borrego Dump Road. Those plants had already dispersed their seed, implying that the seed bank may contain as many as a million seeds waiting to sprout in future years. 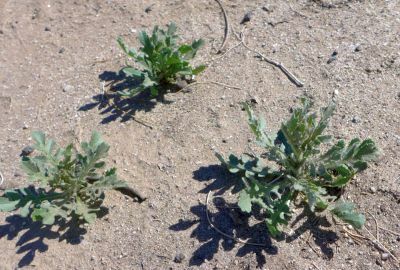 The quick spread of this species from just one plant, or a handful of plants, to almost one thousand plants in a few years, and then ten thousand plants in the next year, with possibly one million seeds remaining in the seed bank, suggests that this is yet another invasive species that could further degrade our desert ecosystem. 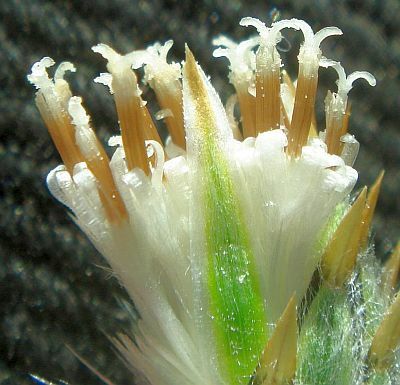 The genus Volutaria is closely related to Centaurea, which has several well-known terribly-invasive species, such as yellow star thistle, C. solstitialis and spotted knapweed, C. maculosa. Worse, this species has now been seen in Upper NewPort Bay in Orange County; see Map of the population in Upper Newport Bay. It is not clear how these populations are related. 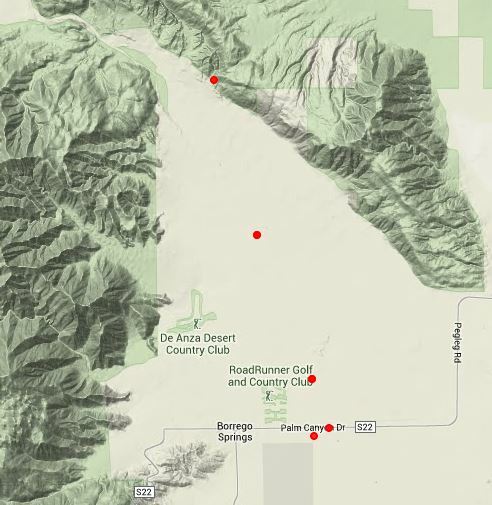 Perhaps someone visiting Borrego Springs from Orange County may have brought it back on their tires, shoes, or horses, or perhaps nursery stock from a Volutaria-contaminated Borrego Springs nursery was brought to Orange County. It is even possible that both populations may have been introduced independently by birds migrating from Chile, from the well-known California - Chile connection. 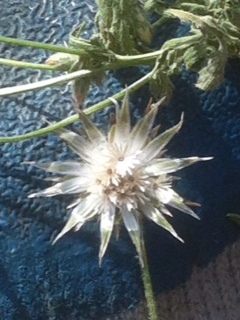 This species was first identified as Volutaria canariensis, Canary Island knapweed, perhaps because of the white flowers. Fortunately, Chris McDonald sent our pictures to colleagues in Spain, who thought it was Volutaria tubuliflora. Our plants have white flowers, matching the flowers of V. canariensis, and not the usual purple or violet flowers of V. tubiliflora, and so at first glance appear to be V. canariensis. 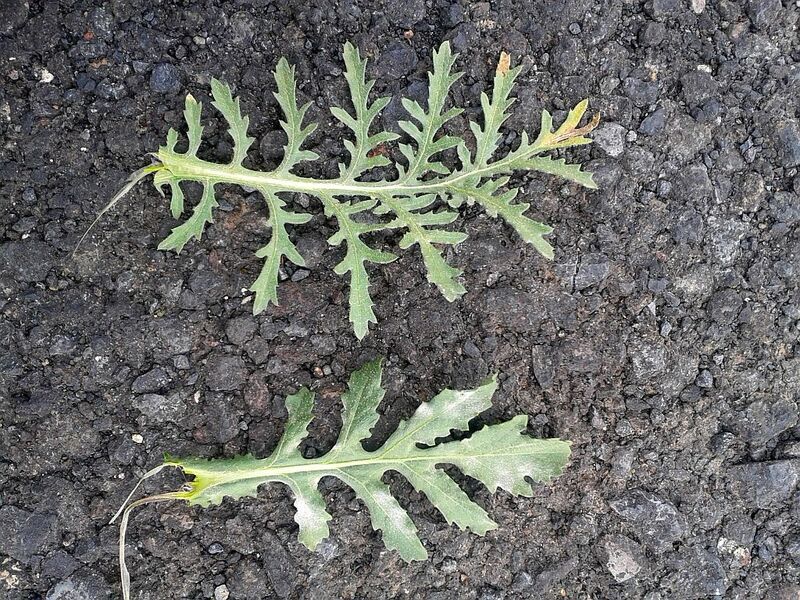 However, these two species have quite different leaves, and there is little doubt that our plants match the wider less-cut leaves of V. tubiliflora much better than the deeply-cut leaves of V. canariensis, as shown in the following photographs supplied by Chris from one of his contacts in Spain. Fig. 2. 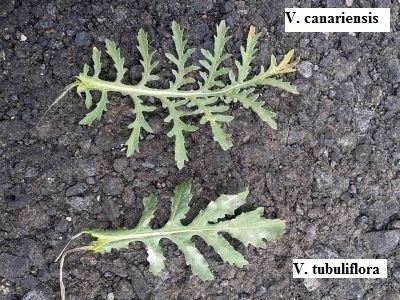 Comparison of V. canariensis and V. tubiliflora. Click on the pictures for larger versions. 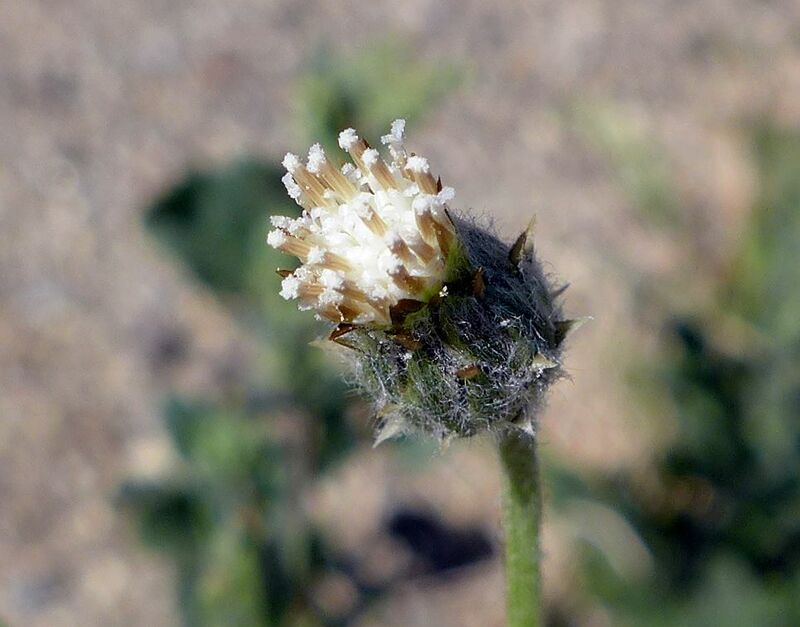 Plants identified as V. tubiliflora have already invaded the Atacam Desert Region in Chile, and this species is known to have white flowers in very arid areas of southwestern Morocco. However, the flowers of V. tubiliflora look quite different from the flowers of our plants, and the plants in Chile. V. tubiliflora has the widest range of natural geographical distribution of the genus being present from southern Europe to Arabic peninsula, including Macaronesia. 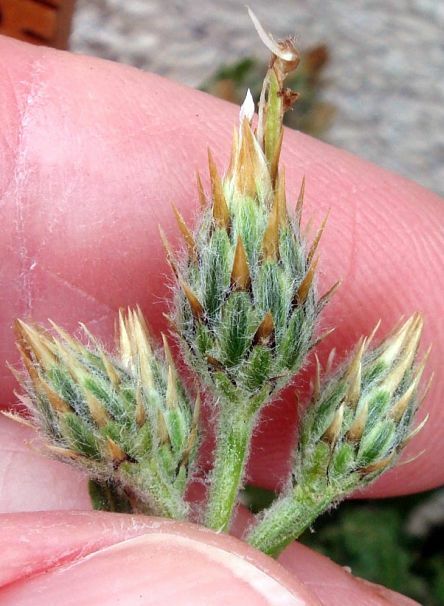 See the Spanish-language article Volutaria tubuliflora, a new alien plant species in Chile. Fig. 3 shows photographs of plants in the field taken by Frank Harris. Fig. 4 shows photographs of plants in the field taken by Kate Harper. Fig. 5 shows photographs of plants in the field taken by Tom Chester. Fig. 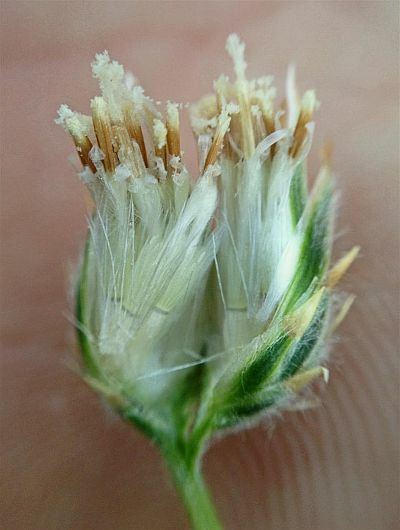 6 shows photographs of one large plant removed from the field, including microscopic close-ups of the flowers and seeds. Several large Volutaria plants with bicycle leaning against them for scale. Single seed ready for dispersal. 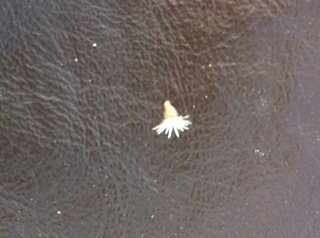 Single seed with pen tip for scale. Fig. 4 shows photographs of plants in the field taken by Kate Harper. Click on the pictures for larger versions. 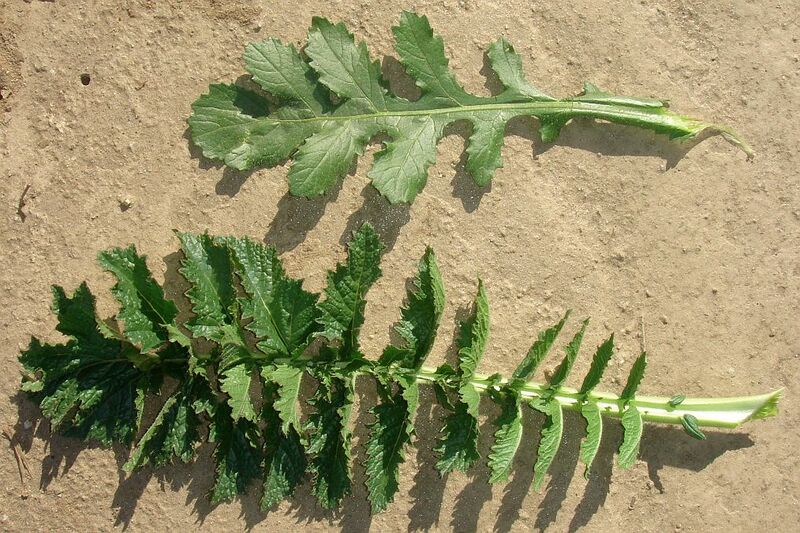 Two plants in the field. 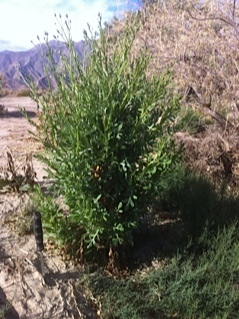 Habitat shot of vouchered plant in the field (#1878). The vouchered plant is circled in orange. 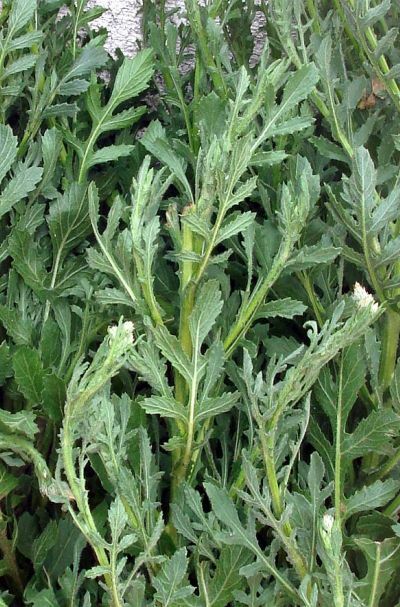 Closeup view of vouchered plant (#1878). 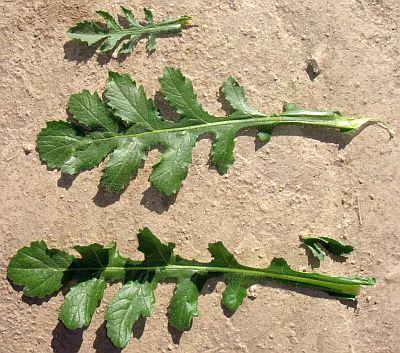 Top (adaxial) surface of three different-sized leaves. 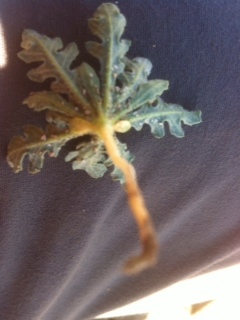 Bottom (abaxial) surface of three different-sized leaves. Comparison of leaf of Volutaria (top) to leaf of Brassica tournefortii (bottom). Fig. 4. 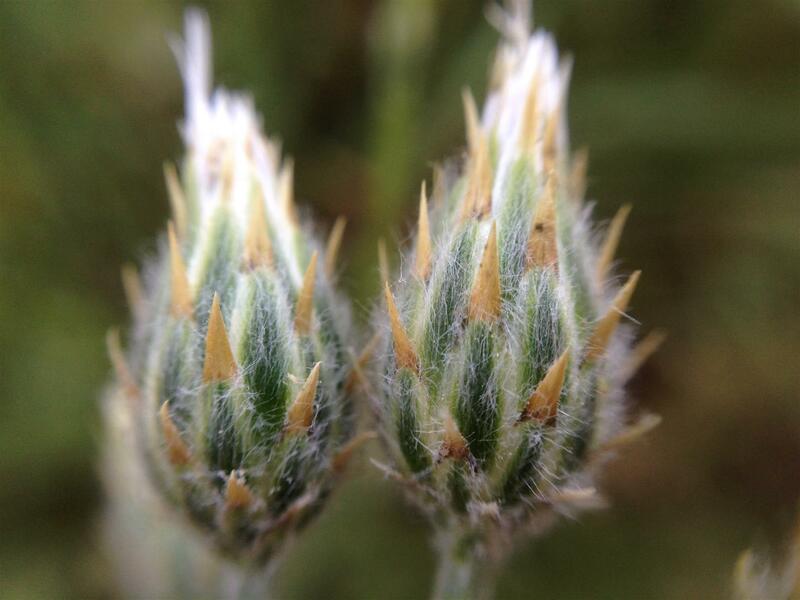 Photographs of Volutaria plants in the field, taken by Kate Harper. Click on the pictures for larger versions. Fig. 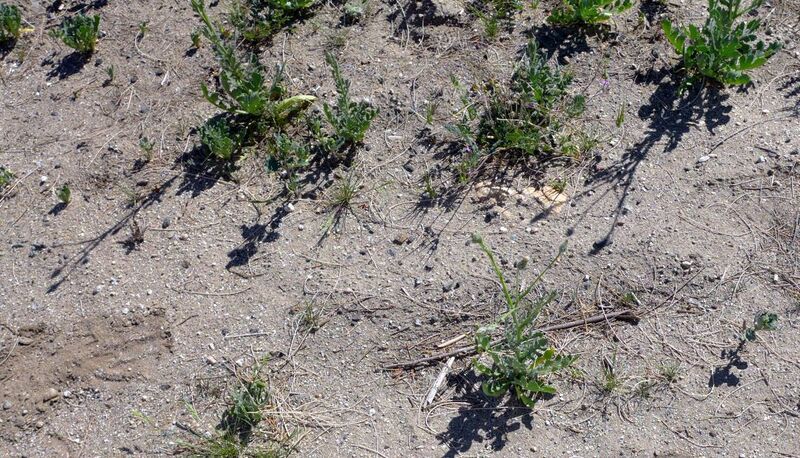 5 shows photographs of a patch of Volutaria that was intentionally not weeded out in early 2015, so that it could serve as a training ground for people removing Volutaria elsewhere. 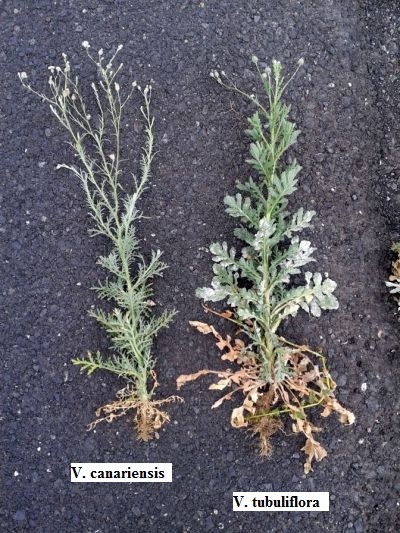 These plants were photographed on 25 February 2015 just as they were coming into bloom, and then weeded out the next day by Pat Matthews and her group and bagged before they could set any seeds. There were ~1000 plants in this very small area! Fig. 5. 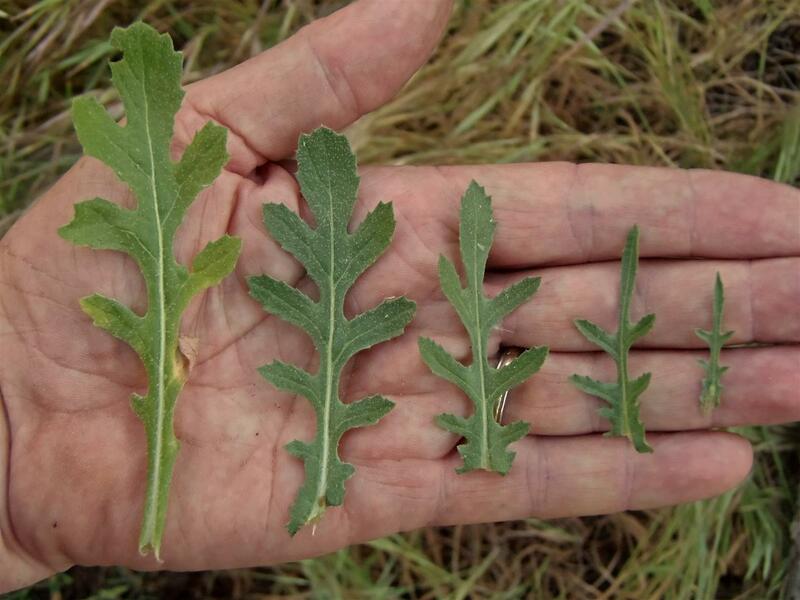 Photographs of Volutaria plants in the field, taken by Tom Chester on 25 February 2015. Click on the pictures for larger versions. Fig. 6 shows photographs taken by Tom Chester of one of the plants removed from the field by Frank Harris. Click on the pictures for larger versions. Entire plant. Note the yardstick on the left for scale. 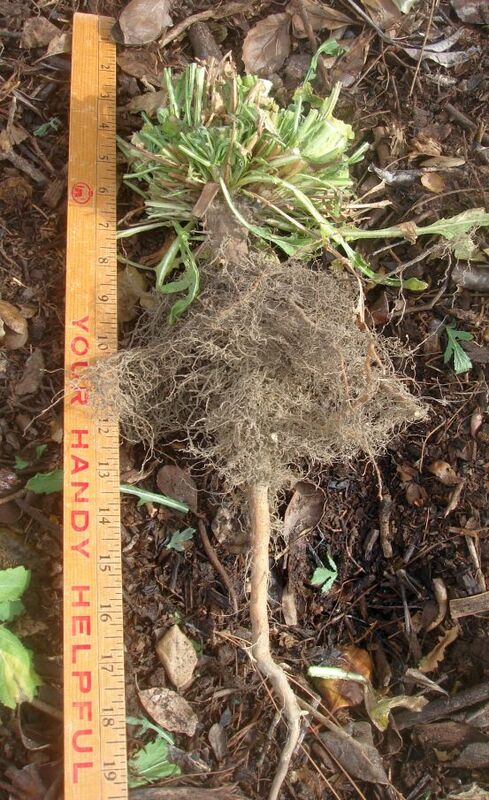 The cardboard hides the massive taproot shown in a picture below. Leaves. 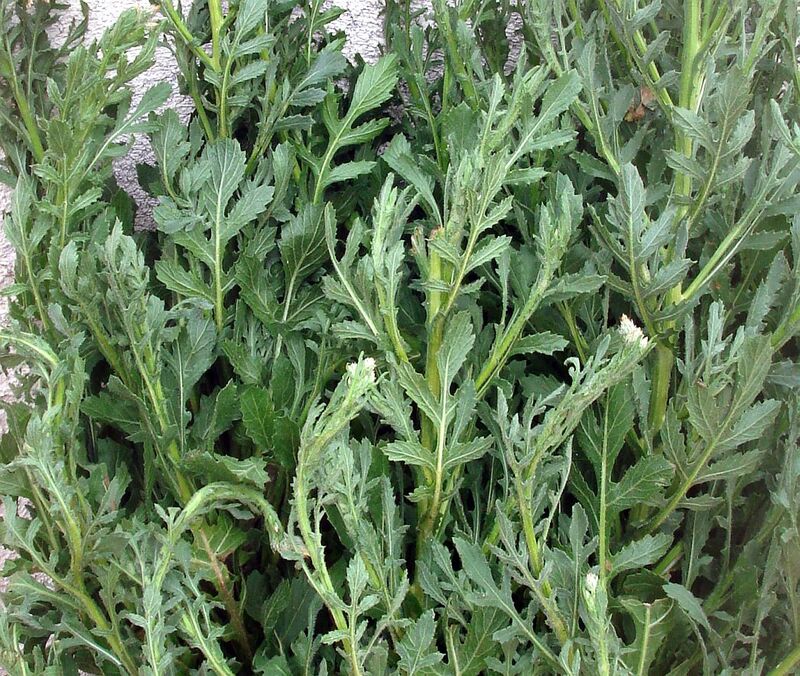 The leaves are not in their natural state since the plant was bagged for 24 hours. 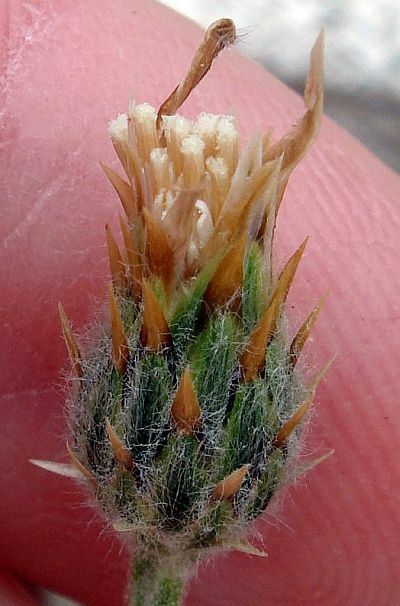 Inflorescence of three heads on one stem. Close-up of one head from the side. 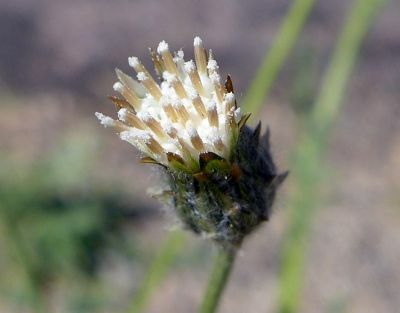 Note the brown acute tips to the otherwise-green phyllaries; the tangled hairs on the phyllaries; the white disk flowers barely poking out of the head; the single elongated phyllary tip at upper right; and the single elongated disk flower at upper left. 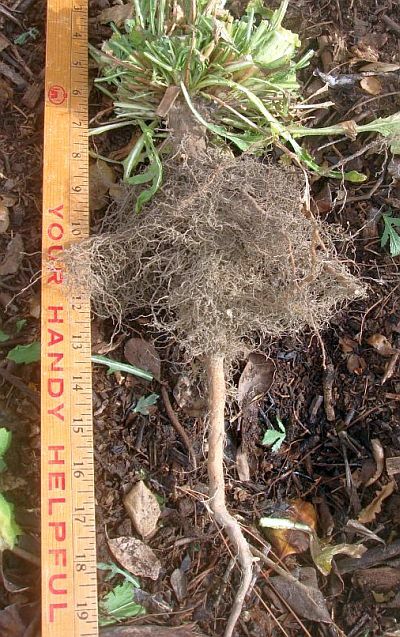 Root system. Note the very strong taproot, along with the many roots near the surface to capture light rainfall. 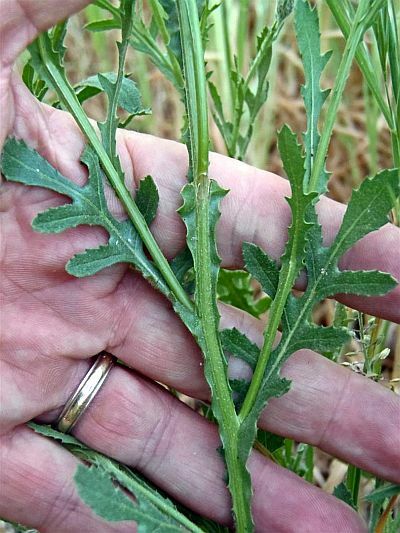 The dense leaves at the base of the stem have been trimmed to show the root more clearly. Single disk floret. 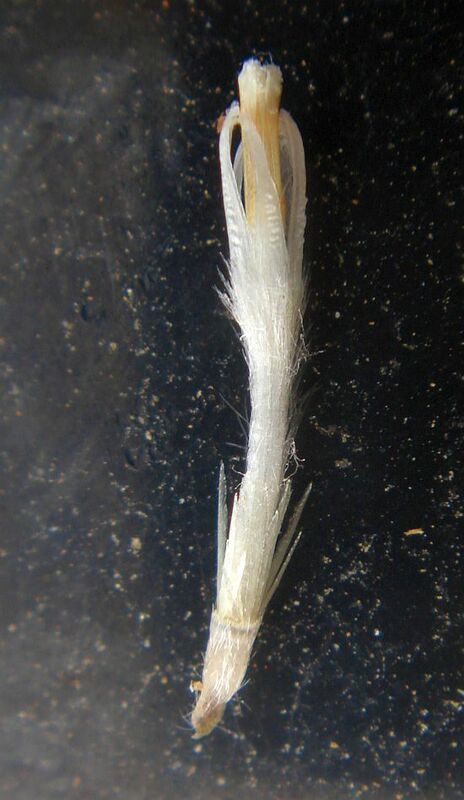 Note the hairy seed; the pappus of scales; and the increased density of hairs on the upper corolla just below the corolla lobes. Head in full flower showing the styles and one elongated phyllary. 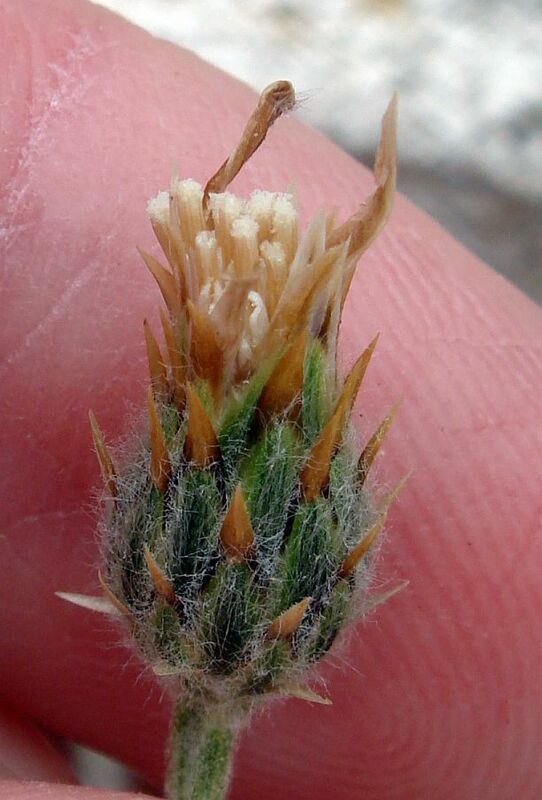 Head in bud cut in half to show the wrinkled young disk florets. The receptacle has abundant chaff that is out of focus in this picture. There is one disk floret that is grossly elongated in the outer row in the back. Fig. 6. Photographs of a Volutaria plant removed from the field, taken by Tom Chester. Click on the pictures for larger versions. Fig. 7 shows photographs taken by Ron Vanderhoff of the Orange County population. Click on the pictures for larger versions. Photographs of plant and flowering head from Flora of the Canary Islands. Flower head by Laura Caceres. Photographs of V. tubuliflora to be added. Fig. 8 shows all locations where Volutaria have been found in any year, with Fig. 9 showing where the densest concentration of plants are. All plants have been removed from all of the mapped locations except for three of the largest populations that are still being worked on as of 5 March 2015. Maps from previous years are shown in Figs. 9 to 11. Fig. 8. Map of all known Volutaria locations. Fig. 9. Map of all known Volutaria locations, with locations where 50 to 380 plants were removed in 2015 marked with filled blue circles, and locations where 876 to 1794 plants were removed in 2015 (along with one location at lower right in the map that has a very large number of plants yet to be removed) marked with filled black circles. The small red circles show locations where 1 to 24 plants were removed. Fig. 10. Map of Volutaria locations found by Frank Harris in 2014. Fig. 11 shows the first known locations of Volutaria from 2010, 2011, 2012 and 2013 (see Occurrences in 2010 to 2012 for details). No survey was done for the species in those years. 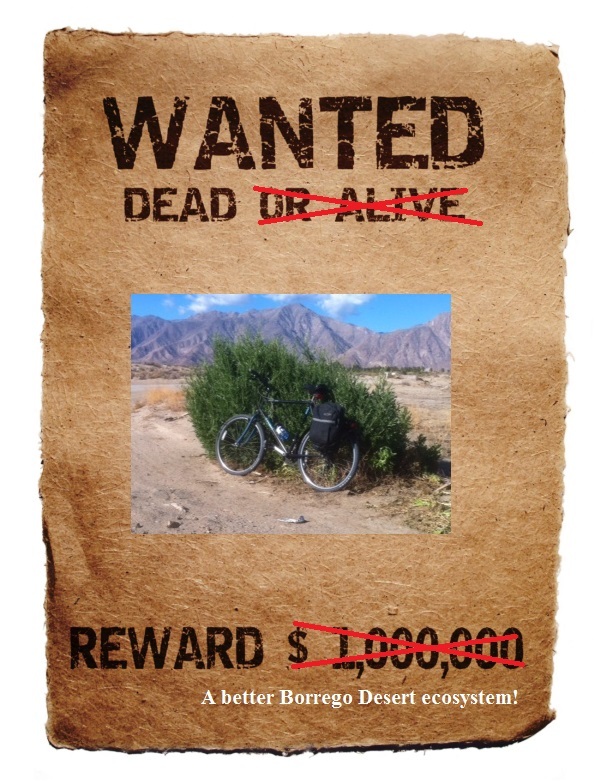 The locations are in the same area as the ones found in 2014 except for the single plant found on the Alcoholic Pass Trail in 2010 near the Coyote Creek Trailhead. Fig. 11. 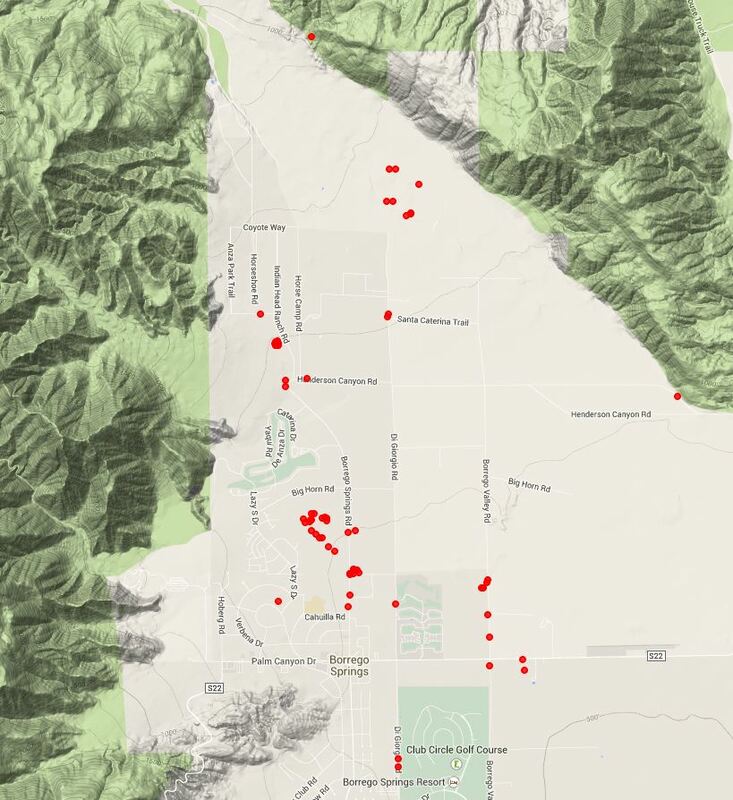 Map of Volutaria locations found in 2010 to 2013. Fig. 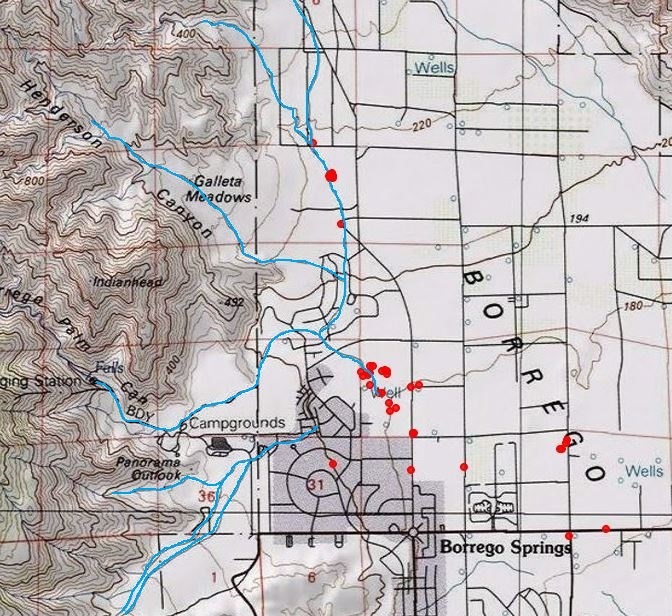 12 shows the 2014 locations on the topo map, along with the drainage highlighted where most of the population is found. Fig. 12. 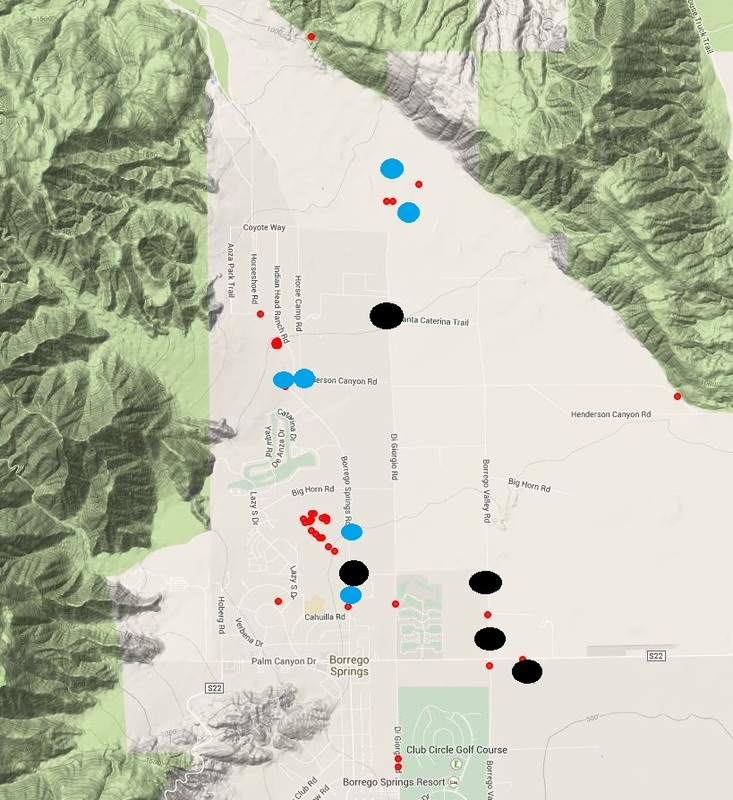 Map of Volutaria locations found by Frank Harris in 2014 on the topo map, with drainages with monsoonal flooding in Summer 2013 traced in blue. The sightings in 2010 through 2013 were made in April, May and June, and may have resulted from winter rain. In contrast, the sightings in 2014 are almost exclusively in areas flooded by water from monsoonal summer / autumn rains, especially where the water puddled, depositing mud. The observed distribution of Volutaria might have been over a much-larger area if there had been widespread abundant rainfall in the winter. Table 1 gives the number of plants found at each of the sites where Volutaria was found, all of which were removed. 9 57 A large green rectangle in Google Earth View, bounded by Borrego Springs Rd on the East; Lazy S/ Diegueno Dr, edge of residences on the West; Big Horn Dr. on the North; and an unnamed sand rd. on the South. 13 89 DiGiorgio Rd.west road edge, 0.8 mile north of Henderson Canyon Rd. 2010 February 23. 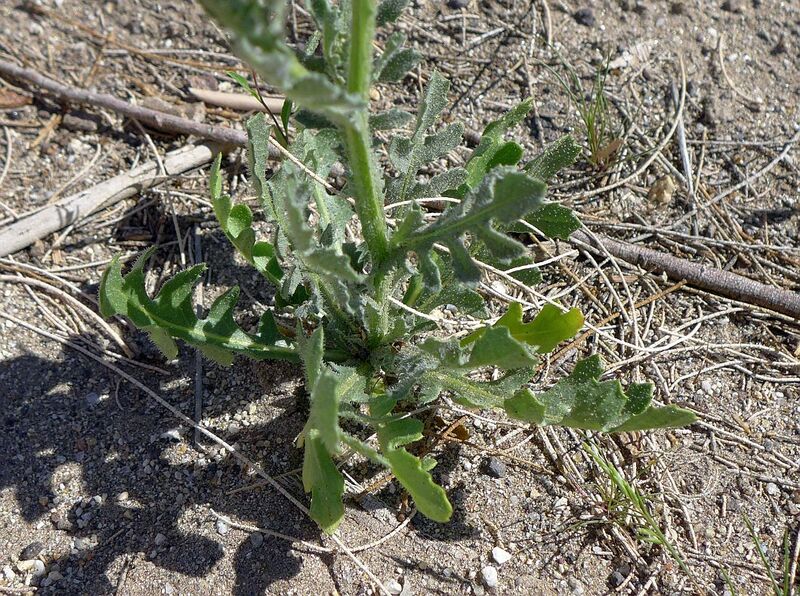 The first known sighting of this species, but as an undetermined mystery plant, was of a single plant at mile 0.27 on the Alcoholic Pass Trail by RT Hawke and Tom Chester. 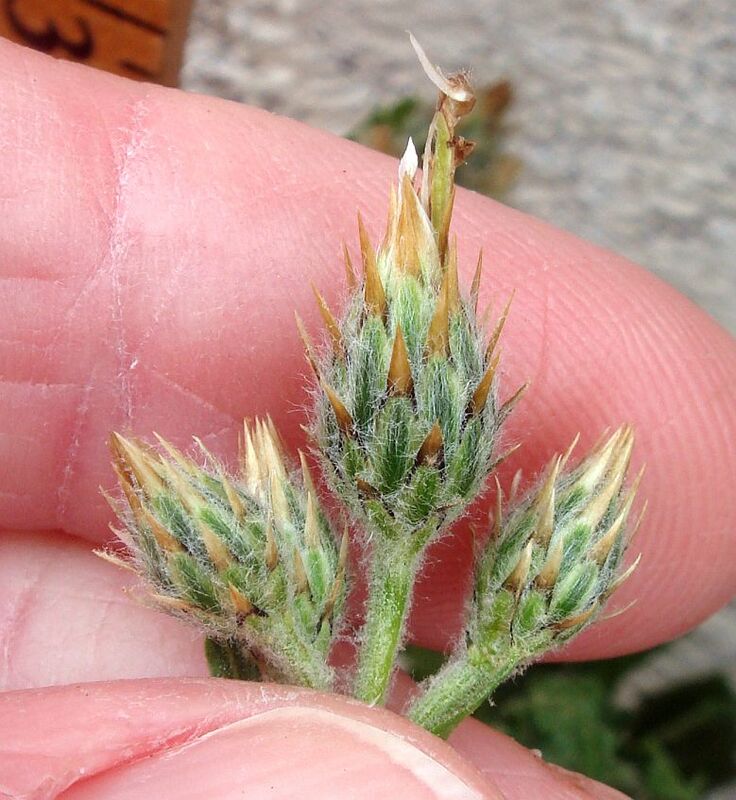 The plant only had very young buds on it. 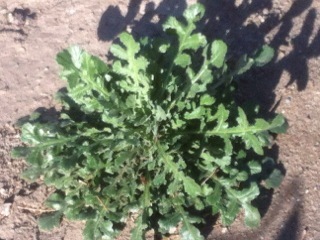 The plant appeared to be a Centaurea species, but Tom couldn't match the plant to any known Centaurea. RT tried to relocate this plant a week or two later, to get a mature flower for the determination, but someone had already weeded out this plant. 2011 March 18. Ruth Ehly, a San Diego County Plant Atlas parabotanist, visited her adopted square F24 with Larry Hendrickson and Whitney Meier. 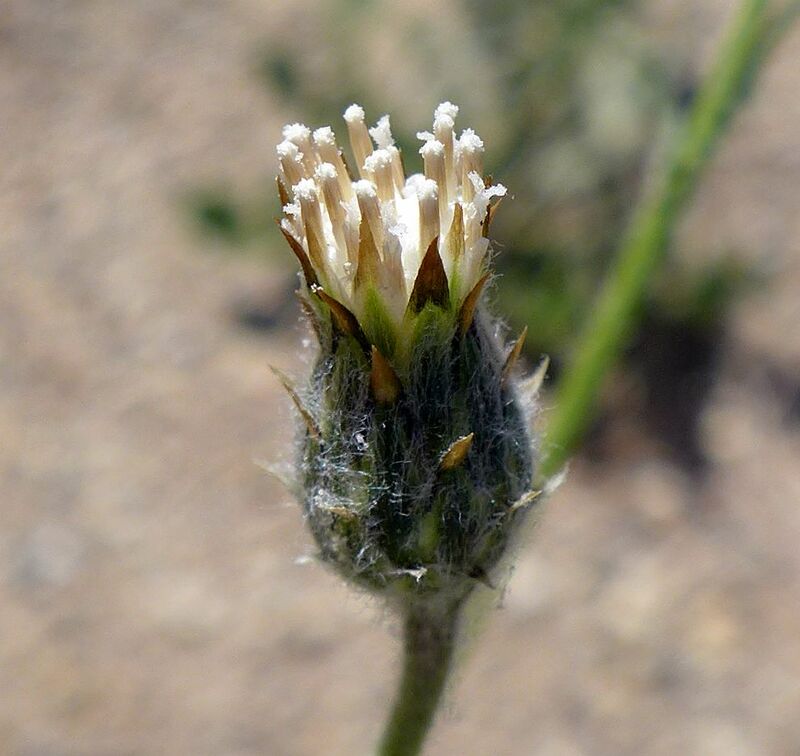 At the Borrego Valley electrical substation, they noticed a few plants of a species they didn't recognize which were not yet flowering. The plants had the look of a Centaurea species to them, too, but again didn't fit any of the descriptions for it or the closely-related Volutaria muricata that was in the Jepson Manual. 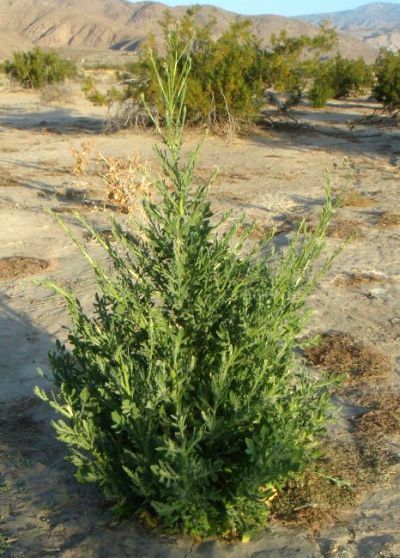 Nonetheless, Whitney searched for images of Volutaria plants, and found the single online image of V. canariensis, which appeared to be a match. (Note that it was later discovered that our plants were actually V. tubuliflora). Some time later, Ruth made a collection of the Volutaria, and removed the few plants. 2011 April 6. Larry Hendrickson, Paul Johnson and Chris McDonald returned to Ruth's site to show the new species to Chris, in hopes that he could identify it. They searched nearby and found hundreds of plants. They collected more specimens. 2011 April. Larry took the specimens to Jon Rebman at the San Diego Natural History Museum. Jon sent scanned images to David Keil, the Jepson Manual Asteraceae author, who sent them to Gerhard Wagenitz, an authority on Volutaria, and the author of the name V. canariensis. 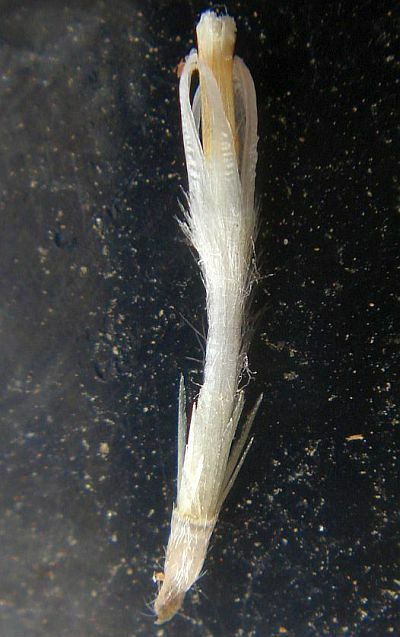 Wagenitz said that it did appear to be V. canariensis. (Note that it was later discovered that our plants were actually V. tubuliflora). 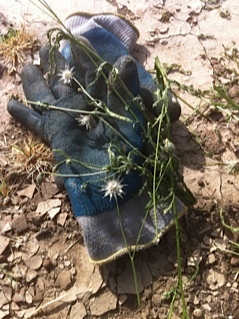 Scattered Volutaria plants were found by Whitney east of Christmas Circle between the elementary school and the airport. 2011 June 02. Larry Hendrickson and Bill Winans voucher plants from east of Christmas Circle. 2011 September. Larry writes an email describing the Volutaria, which is the source of the information above. 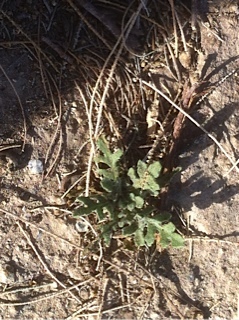 Kate forwarded that to Tom, who found that the Alcoholic Pass plant was a good match to the leaves in the online photograph. 2012 May 2. Larry Hendrickson vouchers plants from DiGiorgio Road. The species description is now available in the online Jepson Manual eflora under the name of V. canariensis. This description was done from plants from Borrego Springs when it was thought the species determination was V. canariensis. Copyright © 2014-2015 by Frank Harris, Kate Harper and Tom Chester.